If you saw my earlier post, you kinda know what this Huckberry Adventure grant is about. If not here's the run down. Huckberry is funding the next great adventure by giving away $1,000 dollars and a bunch of adventure gear from the people at Topo Designs, Poler (which I just bought a photography backpack from), Nemo, and Goal zero. All they wanted was to hear my idea of a great adventure. 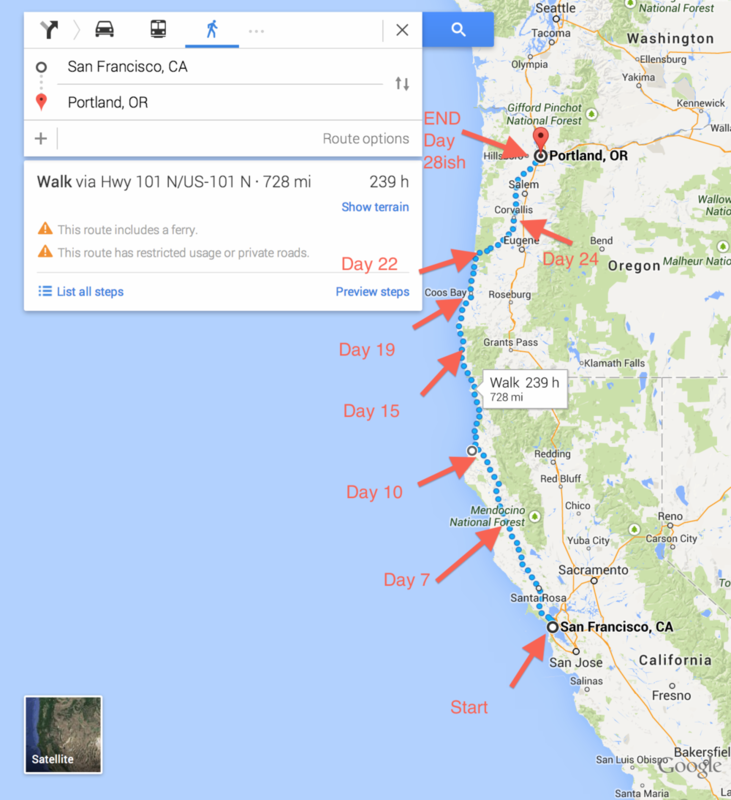 Alright, the plan is to walk / backpack from San Francisco, California to Portland, Oregon in one month. The trip is about 728 miles in length. This may change when we start to go in depth with the route we are taking, but that's an estimate according to Google Maps. Also according to Google it will take 239 hours to walk the length of the coast, although I don't know what pace that is.. soo yeah. So here is the math on how we will do this trip. 2.4 mph for 10 hours with 5 hours of break & 9 hours of sleep for 30 days. After going through Google Map's I have kinda estimated our day by day stops seen below. So when will I do this? Mid-June till mid-July. Evan, Noah, and I get out of school towards the beginning/middle of May. So after that we will prep and work for some extra money for our plane ticket out to San Fran for the start of our trip in the middle of June. We will walk till we get to Portland & then we will fly back to Ohio by mid-July. & thats the plan as of now.